This recipe was a result of a mission. 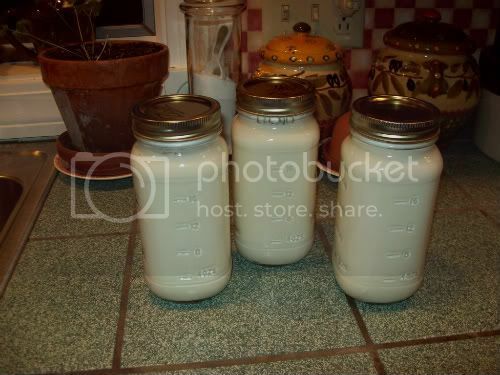 I was on a mission to create, in bulk, homemade organic yogurt for my family. We eat ALOT of it! This is what I would buy. This organic 32 oz. container costs us $3.19 a pop. We were buying 2 of these a week, an average of $6.38 from our weekly grocery budget. For this recipe all you need is a half gallon of organic milk (yeah for buying local!) @ $3.99, and 1 cup of plain organic yogurt @ $ .99. For $4.98 I can make 64 oz. 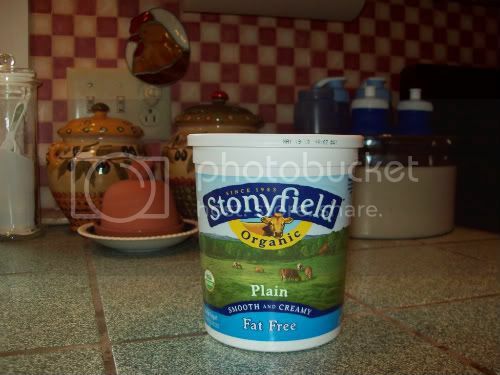 of organic plain yogurt! 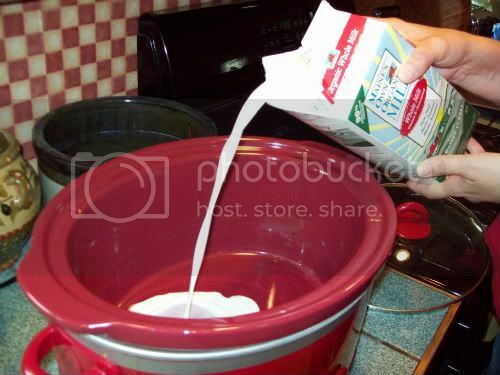 Pour the half gallon of milk into your crockpot, cover and turn on low for 2 1/2 hours. After two and a half hours have elapsed, turn off cooker, unplug from wall and allow to sit, covered, for three hours. Three hours later, whisk in starter yogurt and re-cover. 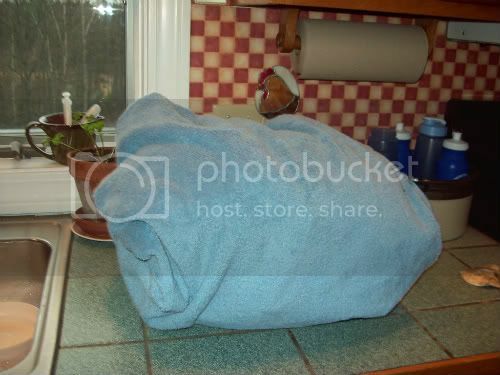 Cover/Wrap the entire crockpot with a large bath towel or blanket and leave on your counter for eight hours. After eight hours have elapsed, the yogurt is done! For convenience I decanted the yogurt into these 3 containers and stored them in the refridgerator. This makes a fantastic smooth yogurt with just the right hint of tang. It tastes better than anything I've ever bought. I like it plain. The boys like it with a little bit of pure maple syrup or honey stirred in. We use it to make smoothies practically daily. If you like fruit in your yogurt just puree your favorite flavor and stir it in. We happen to have an abundance of blueberries so I'll often pull some from our freezer to use. One of our 7 year olds favorite breakfasts is to slice up a banana, put some of this yogurt on top and sprinkle with granola. Our family gives this yogurt a definate 5 spoons! Tip #1: Start this recipe early! This recipe takes 13 1/2 hrs. so timing is everything. I started ours around 6:00 a.m. and finished around 7:30 p.m. You could also start it around 5:00 or 6:00 p.m. and it will be finished when you wake in the morning. 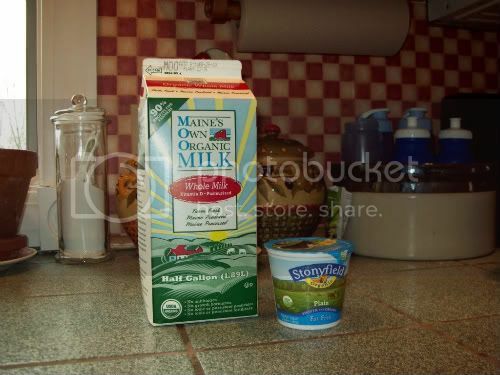 Tip #2: You can use your own organic yogurt (6 oz.) as the starter in the next batch instead of buying a cup at the store. This saves you a bit of money also. 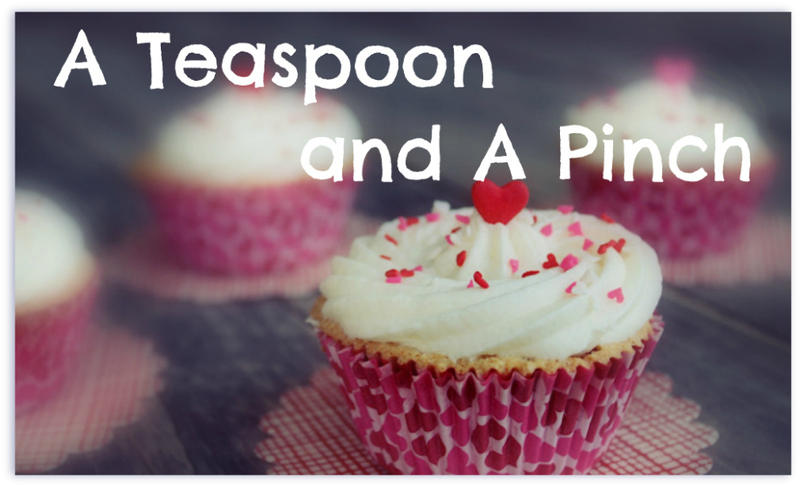 Tip #3: Bake with it! If you have a recipe that calls for sour cream you can replace it with your homemade yogurt. WOW, this is adventurous!!! I'm so impressed! I love this! Way impressed! When you covered it the first time for 3 hours, was that with the lid or with the towel? Do you know why you need a towel versus the lid? Just curious!! I know! How funny. Your recipes are always "adventurous" to me! 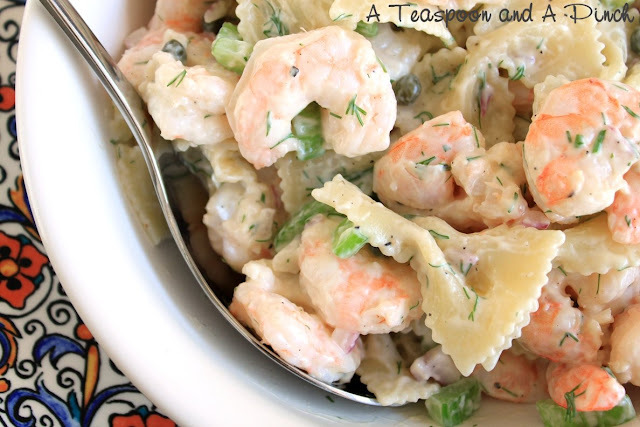 THIS IS AMAZING>>> I am going to have to try it...do you flavor it? Thankfully Thrifty - The first time you cover it, it is just with the lid. I think you use a towel to keep the moisture and warm temp. in. Have fun trying it! Mellisa - I flavor mine after because every one wants a different flavor or I want it plain for cooking/baking. I know people who want vanilla who will add a vanilla bean & sugar. Have fun experimenting with it! It easy VERY easy. There's no messy pans or burning. Easy clean up! Wow! I would never have thought that I could make a large vat of yogurt from a small one. Thanks for sharing this!!!! I am going to try this. Thinks-I've always wanted to learn how to do this. I like your tutorial. Please join me for Tasty Traditions, a Thursday recipe meme. Have a great day! I am trying this asap!! I buy that exact brand of yogurt constantly for my daughter, she LOVES it. Do you know how long the jars last in the fridge? Also, do you know how much sugar to add? For anyone who can't get organic milk and yogurt, I assume this would work, but would the non-organic yogurt have less of the cultures in it? i blogged about doing this, too! it's awesome, isn't it? we also made fro yo with it. Do you know if this would work with raw milk? Does the milk last longer once its turned to yogurt? Or is the expiration the same? Just made some yogurt with your method. Easy and amazing! I followed your directions, however my yogurt came out really watery. Any suggestions? The watery-ness is the excess whey. To thicken up the yogurt, just line a colander with cheesecloth or a clean dish towel and drain the yogurt. About 2 hours of draining for a natural, thick yogurt. 3-4 hours for Greek yogurt. Summer shamlian : low fat or no fat milk could make watery yogurt. When u let the milk and starting yogurt seed mixture sit ., that might not have been a warm setting. I leave the yogurt to sit in the oven with just the iven light switched on. Can this be made from a quart of organic milk? I am the only one eating it and the yield is too much yogurt for one. You can also strain any yogurt to make Greek yogurt. Just line a tight mesh strainer with cheesecloth, or, I use 2 paper towels, pour in yogurt, set over a bowl in the fridge for a few hours and you have Greek yogurt. I also use yogurt in place of buttermilk--I only buy non-fat, plain Greek yogurt as I like to add strawberries and/or blueberries, almond flavoring and a bit of granola for a great breakfast. I make 2 gallons of milk into Greek yogurt weekly. After straining, the left over whey is great to use in any recipe calling for milk or water. We use in in bread recipes, our oatmeal, and smoothies. 13 1/2 hours of work for only $1.40 in savings? Uh, no thank you. 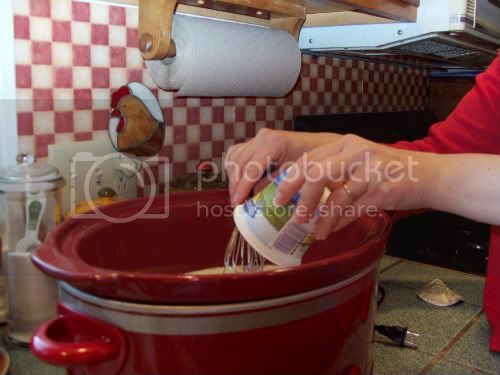 ^The only work is pouring milk into and whisking yogurt into a crockpot. The slow cooker does the work. Didn't work. Tastes like sour milk, not yogurt.